Welcome to Linderhof, our 1920's home on the prairie, where there's usually something in the oven, flowers in the garden for tabletops and herbs in the garden for cooking. Where, when company comes, the teapot is always on and there are cookies and cakes to share in the larder. 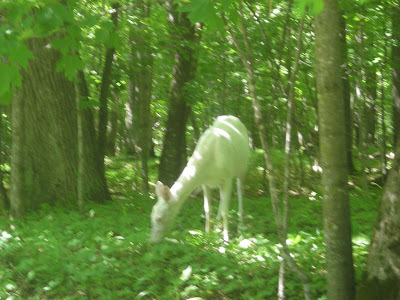 An Albino Deer -- and there were not one but . . . The pictures are a bit blurry but I was so excited hoping that I could get at least one picture of the deer. Deer are beautiful animals and we have lots of deer on the prairie. And some of the biggest deer in the country can be found in our part of Kansas. But I've never seen a white deer before and to see two -- THAT was exciting! 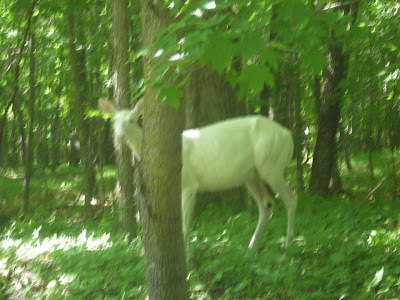 I've since learned that there is an albino deer herd at Father Henepin State Park. Protected they are which may be why we could stop the car and snap pictures without their running away as deer usually do. I felt that they almost expected us to feed them! Seeing these rare and unusual deer was certainly a highlight of our trip to Minnesota. Please join friend Susan at A Southern Daydreamer to see what else everybody has been doing outside this Wednesday. Excellent find... how extraordinaire! You can probably clean up that photo a bit on one of the free online photo websites, using their software. Protected or not, that is a tres cool sighting!!! Tres cool. Wow, a rare find and a beautiful one. So glad you were able to get pics of these beauties! Wow what a great photo op. I have never seen albino deer before. Thanks fot sharing. Happy OD Wednesday. Wow! I've never seen a white deer either. Very cool! Oh, WOW! 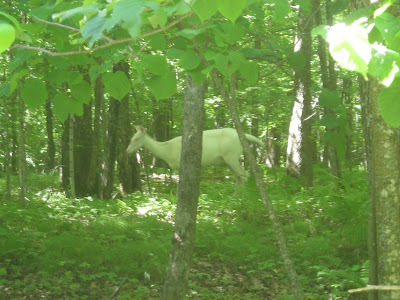 I have seen deer my whole life, but never have I seen an albino deer! And I can't believe you caught two on film! This is amazing. Truly amazing. That seems highly unusual. How neat that you were able to see it. They certainly do look different. Thanks for sharing. I have never seen an albino deer in real life before. Wow, so unique! I've never seen/heard of white deer before. So cool! That is so cool!! 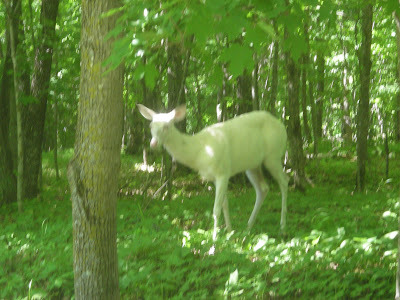 I love deer and to see albino deer, wow! I would have been freaking out with excitment! I dont blame you for having blurry picutres i would be so excited i would be shaking!! What an amazing find. Keep this post :) next you might just find BIG foot!! ;) you seem to have the eye to catch somethings that are illusive. Do you suppose they were twins? How lucky to see these albino deer, I have seen one and thought it was so beautiful.Thank you for sharing. I'm glad you had your camera ready! Thank you for sharing something I doubt I would ever get to see. Happy OW! What fun you must have had. Our DIL is from Minnesota so we've made that Kansas to Minnesota trip ourselves many times! Glad you made it back safe and sound! Great day to locate a white deer. Kewel! What a beautiful animal - so majestic! I'm glad they're protected and that you were able to get pictures of them. Thanks for sharing! Wow! What an amazing outdoor find. Amazing find... 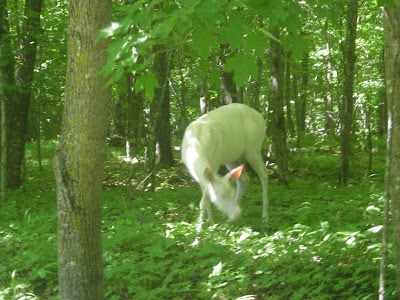 I never even heard of and albino deer ... WOW... thanks for sharing!! Martha, this was fascinating! I'm so glad you were able to get the pictures. Wow! I have never seen a white deer either. I probably would have forgotten how to use the camera in my excitement. Don't think I was even aware of an albino deer! But they are truly beautiful. Must be easily seen out there in the wild with those light colors. Great photos, Martha. I have never seen a white deer and I am sure DH hasn't either. These pics I MUST show him. What a fabulous OW post. I have yet to see an albino deer in the woods. You are a very lucky girl to get pictures. You were so lucky to get those shots! I don't think I've ever seen albino deer before. Very interesting sight. Thank you for sharing them with us. Most unusual post today and I don't think anyone will be able to match the uniqueness of your photos. What a treat, thanks for sharing. Albino deer! How lovely to see them! I'd only heard of them until now, we have a lot of deer in the mountains too, they are so wonderful. My hands would have been shaky too! Thanks for the photos! Love the pictures of the two albino deer. It's really a rare find and i never have seen an albio deer before. Wow, I have never seen or heard of albino deer. How amazing!. What a great time you had. Thanks so much for stopping by to visit my blog - please come back again! Wow, I agree protected or not, a great opportunity. There used to be one around here along time ago. Deer are such wonderful animals to watch. Glad to hear you had a good trip. I love deer...we have them all over here. But your photos are a treasure for sure, to see two white deer! Thank you for sharing. What a rare treat you had, Martha. Glad you had your camera, blurry or not. Just beautiful!! ‘Hoosier’ Friend (In The Kitchen)? The foundation of my little town on the prairie -- Fort Scott National Historic Site originally built in 1842. To see the Fort Scott National Historic Site website, click on the picture. LINES FROM LINDERHOF IN PRINT! LInes from Linderhof, A weekly column in the Saturday Issue of the Nevada Herald and the Saturday issue of the Fort Scott Tribune. Every afternoon . . . at half past three, we stop for a cup of tea! It's Six O Clock . . . The Weekender . . .and a spin off!